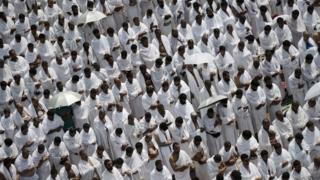 Hajj stampede: Could tragedy have been prevented? The stampede that killed at least 700 people performing the Hajj pilgrimage outside the Islamic holy city of Mecca has once again raised questions over safety and the actions of the Saudi authorities. The Hajj is one of the five pillars of Islam. Every able-bodied Muslim is required to perform it at least once in their lifetime. Although it is a physically demanding rite that takes place over a few days and involves travelling back and forth to several sites that are miles apart - often on foot - the number of pilgrims visiting Mecca has increased steadily over the past few decades. It is estimated that two million people are performing this year's Hajj. The Saudi government has always maintained that protecting the "House of God" and ensuring the safety of the millions of pilgrims who descend on Mecca every year to perform the annual Hajj as well as the lesser rite of Umrah, which can be performed throughout the year, is one of its most important responsibilities. In fact, the Saudi king's official title is The Custodian of the Two Holy Mosques. Billions of dollars have been spent expanding Mecca's Grand Mosque itself, and several bridges and tunnels have been built to accommodate the ever increasing numbers of pilgrims performing rites at sites outside Mecca like Mina, where many deadly stampedes have occurred. Although the Hajj has not witnessed a tragedy on this scale since 2006, some have maintained that the sheer number of people moving back and forth between sites that are in relatively confined spaces has meant that accidents are difficult to prevent completely. A major challenge that organisers face is the fact that pilgrims come from 200 countries around the world and speak hundreds of different languages. This has made it difficult for security personnel to ensure that pilgrims follow safety procedures that would prevent minor incidents spiralling out of control as panic ensues. Saudi officials have tried to raise awareness among prospective pilgrims as they embark on this spiritual journey, stressing that following directions and regulations is to everyone's benefit. For their part, organisers of pilgrimages from other countries have also taken measures to promote awareness among members of their delegations. However, it is not only the danger of stampedes and fires that the Saudi government has to guard against. The jihadist militant group Islamic State has targeted both Shia and Sunni mosques inside Saudi Arabia over the past few months. Its apocalyptic vision suggests that attacking pilgrims during the Hajj itself is not out of the realm of possibilities. In 1979, militants did in fact lay siege to the Grand Mosque and killed dozens of worshippers shortly after the end of that year's Hajj. To guard against acts of terrorism or sabotage, tens of thousands of security personnel have been deployed, and hundreds of security cameras installed to monitor the Grand Mosque and its environs. While some are suggesting that the quick response of Saudi civil defence forces limited the number of casualties on Thursday, others are accusing the organisers of negligence. It is also worth noting that in a region gripped by political violence and sectarian turmoil, the Saudi authorities issued a warning that they "will not allow any party to exploit Hajj for political purposes". The message seems to have been directed at Iran, whose pilgrims were involved in clashes with Saudi security personnel in 1987 following a political demonstration. The incident resulted in the deaths of more than 400 people and severely strained relations between the Sunni and Shia powers.